Lush hills, rows and rows of grapevines in private vineyards, and that golden California glow! Sunset is our favorite time for photos and the perfect time for a shot of a wedding getaway car exit in a white convertible Rolls Royce! The impulse to raise their arms in joy as they headed down the winding road together makes transforms the image from a lovely landscape to a definitive moment! I love how the one of the bride's arms is wrapped around her husband while the other is waving her bouquet in triumph. I love the groom's pumped fist. I love the sun's glow on the vineyards and the vintage car. 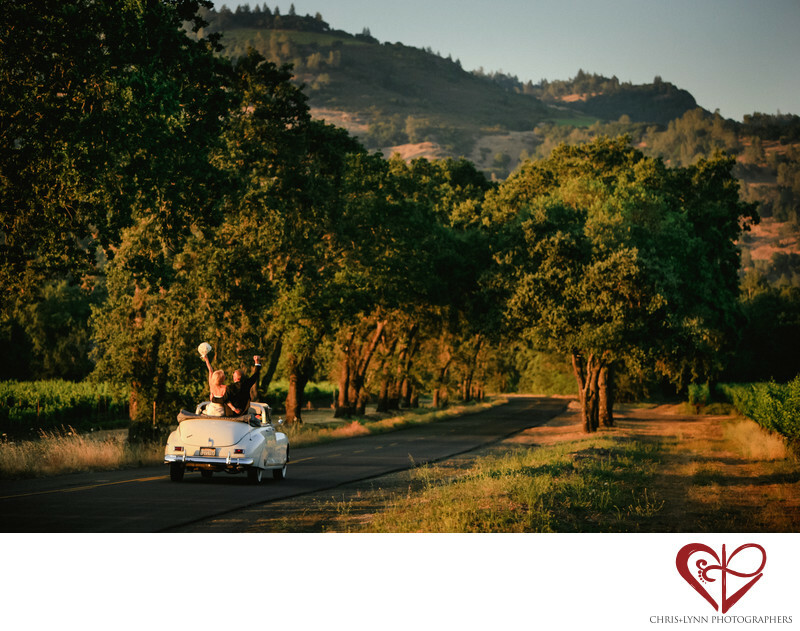 The image of the newly wed couple driving down the road into the sunset together as a symbol for their journey towards a new life together is classic, but true - after all, as the poet Nikki Giovanni wrote, "We love because it's the only true adventure." The Napa Valley is a popular location for California vineyard weddings due to its proximity (a one hour drive) to both San Francisco and Sacramento. The driving time from SFO airport is only 90 minutes, and there are 3 additional airports to choose from within a 1.5 hour drive: Santa Rosa, Sacramento, and Oakland.